For all the iPad Pro 10.5 inch owners, there is great news! You don’t need to traverse different portals to enhance the functionality of your gadget. Check this list of some of the best iPad Pro 10.5 inch Accessories to personalize your iPad Pro. The tech market is fully fledged with top-rated accessories for iPad Pro 10.5 inch. Before diving into 10.5 inch iPad Pro’s accessories, here is a quick look at the tablet itself! Apple’s 10.5 inch iPad Pro tablet comes with a 10.5-inch display screen. It runs on three variants i.e. 64GB, 256GB, and 512GB. The 12-megapixel rear camera and the 7-megapixel front camera enable you to click superior quality of pictures and record high-quality videos. Furthermore, the home button is pre-equipped with a fingerprint sensor. Starting from its safety to giving it a luxurious look, there is a wide range of accessories available – be it its cases, screen protectors, keyboard cases, sleeves, Bluetooth headphones, stands, portable chargers, adapters, and much more. If you are an owner of 10.5 inch iPad Pro then this list of some of finest iPad Pro Accessories requires your attention!! Apple Pencil performs all the tasks that a conventional pencil does. The only difference is that the Apple Pencil does all the tasks with pixel perfect precision. Moreover, its sensitivity to pressure and tilt lets you design various artistic figures with shading. The magnetically attached cap keeps the pencil’s point covered and protected when not in use. You get a lightning adapter and an extra tip on the purchase of this pencil from Apple. Pros: This Apple Pencil is compatible with your 9.7 inch to 12.9-inch models of iPad Pro. Made from premium quality of vegan leather, the pencil holder case from Apple is compatible with your iPad Pro 9.7 inch, 10.5 inch, and 12.9 inch. It is a flap case; hence keeps your pencil protected from unwanted bumps and drops. The extremely stylish case is sleek in design and light in weight. Hence it will easily slide in your iPad Pro’s Sleeve or case. Pros: This pencil holder has a USB Adapter pocket which holds your USB adapter safely and keeps it handy. One more that needs to be added to the list of best accessories for your iPad Pro is the flip case from JETech. This flip cover serves as a shield for the back of your iPad Pro and its screen as well. The precise cutouts give you full access to the camera, buttons, and ports of your iPad Pro. Want to enjoy hands-free operation on your iPad? It is possible to do so with this flip cover! Transform your flip case into kickstand case just by folding the back of the case to a triangle stand. You can now enjoy watching videos or movies, having a video chat with friends or family, and much more. Pros: This flip case offers your iPad Pro the auto wake up and auto sleep functions when you open and close the case respectively. The leather flip case from Belk is the one that you should count on. Enclosed closure keeps your iPad safe and secure while traveling. The leather strap provided allows you to tuck your iPad with your bag or backpack. Flip open the case and you get access to a 2-in-1 clip-on application. The two card holder slots allow you to store your important business cards, debit cards, or credit cards. You can make use of this card holder as a kickstand case. The elastic hand strap provides you a firm grip while holding the iPad in hand. Pros: All of the buttons and camera openings are correctly located and the speakers sound great through the perforations. Skinomi is one of the leading brands manufacturing screen protectors for various smartphones, tablets, or iPads. Protect your iPad Pro’s screen from unwanted drops, falls, scratches, or grimes with this thin film. The tempered glass screen protector provides Ultra HD clarity. The ExTouch capabilities of the protector do not affect the touch screen responsiveness of your iPad. Furthermore, the electro and oleophobic coatings do not allow dust particles or dirt to nest on your screen; hence keeping it always clear. Pros: Made from ultra-thin tempered glass, this protector lends 99.9% transparency and unparalleled protection to your iPad Pro. Apple AirPods can be easily paired with your Bluetooth-enabled devices. Just put them in your ears and the audio starts automatically! It pauses when you take them out! You can also attend your important calls, adjust the volume, change the song track, and navigate just by activating Siri on your device. You can keep them safe in the charging carrying case provided which not only protects them from external impacts but also charge them. Pros: These AirPods offer you 5 hours of listening time in single charge. The list includes the smart keyboard which rejuvenates your typing experience. What you need to do is just connect this smart keyboard with your iPad Pro using the smart connector and start typing. It’s innovative new surface lets you have a two-way exchange of power and data both. Pros: Being portable in nature, you can carry this smart keyboard along with you to a park, café, or your workplace to complete your unfinished work. Designed with Smart Connector Technology, this charging stand is the perfect home base for your iPad Pro which will fit in any of your rooms. Just place your iPad on the stand and it starts charging. Moreover, the stand provides 700 viewing angle so that you can comfortably watch videos or surf the web. The anti-slip pad holds your iPad sturdily. Also, the curved surface of the stand is capable of withholding even large-sized iPads. Pros: This charging stand is compatible with any iPads that have Apple Smart Connector. Rest your iPad Pro on the iPad stand and enjoy hands-free operation! You can even connect some other accessories with your iPad Pro and transform it into a mini Mac or a laptop. Play your favorite games, watch movies, listen to music, surf the internet, utilize your apps, attend important business meets on video chat, and much more – everything at your convenience. Place the iPad horizontally or vertically and then adjust the viewing angle as per your need. Pros: This stand is capable of holding all your devices ranging from 4 to 13 inches in size. Do you often travel? Do you face battery draining issues? If yes, then here is the car charger for you! Capable of charging your smartphones, tablets, iPads, and other devices, this car charger is a must-have accessory for all the long-distance travelers. Considered to be the smallest amongst all the car chargers available in the market, it is built with Advanced Charging Technology. The two USB charging ports can charge two devices simultaneously. The LED light provided makes the two ports visible in the dark. Pros: The Multi-protect Safety system provided by Anker safeguards your device against short circuits, surges (overcurrent), and other damages. The external battery pack commonly named as the power bank is the essential accessory you can have. With a huge capacity of 20000mAh, it is capable of charging your iPhone 7 4.5 times, and an iPad Pro 1.5 times. Engineered with AiPower technology, this power bank protects your device from excessive current, overheating, and overcharging. The dual USB ports enable you to charge 2 iPads at Max speed with combined 3.4A output. Pros: You get a micro USB cable, user manual and 45-Day Money Back Guarantee and 24-Month Product Replacement Warranty Card when you purchase this power bank from Aukey. The power bank is the ultimate source of charging for all your devices – whether you are out for a trek, gone for a trip; have to travel long distance on roads, or wherever you are. Anker’s 10,000mAh battery is the smallest and lightest of all the power banks available. Designed with PowerIQ and voltage boost technologies, this external battery pack offers you high-speed charging. To keep your portable charger safe and sound, Anker provides you a travel pouch and 18 months of the warranty period. Moreover, you also get a micro USB cable to charge a wide range of devices. Pros: Being extremely slim and compact, it easily slides into your pocket or purse without adding any bulk. Want to get rid of those tiring and boring long car rides? Want to keep your kids occupied during long journeys? 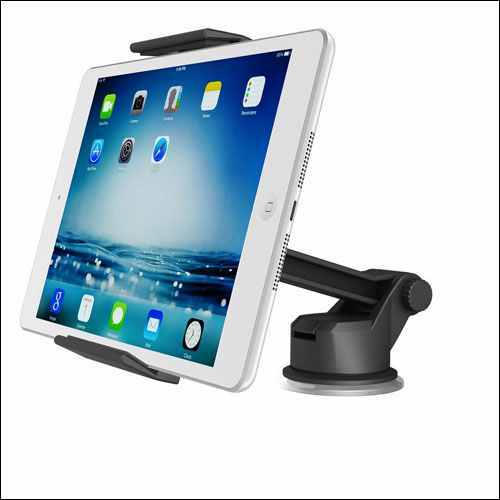 The car mount headrest is one of the best accessories for iPad Pro. What you need to do is just mount the holder on your car’s headrest bars! You can then place your iPad Pro on this mount and enjoy hands-free operation. The firm grips won’t let your iPad fall or even move on bumpy roads. The swivel ball joint in the holder offers you 360-degree rotational facility so as to ease your viewing. Pros: You can mount any of your tablets or iPads whose screen size is in the range of 7 to 10.5 inches. Enjoy hands-free operation of your tablet, iPad, or smartphone while driving! Wondering how? The dashboard tablet car mount enables you to do so! The suction cup provided at the base of this car mount fixes sturdily on your car’s dashboard. Mount your iPad, tablet or smartphone on the arm and adjust the length as per your device’s size so as to provide a firm grip. This arm is flexible enough to provide you with comfortable viewing angles. Set the destination in your GPS tracker and navigate yourself to the place with your hands-free. Attend your important calls while your smartphone rests on the mount! Pros: You can fit and remove your iPad easily – whether with the case or without it. For all the music lovers out there, how can we forget to include these wireless headphones in our bucket list? As per the present era scenario, one will definitely relate to this statement – “Travel is incomplete without music”! The Bose wireless headphones are not only your perfect music partner but also offer you to attend your important calls. Whether you are on a cliff or traveling in a windy atmosphere – you can talk on your phone without any interruptions due to its noise cancellation technology. You can enjoy 20 hours of non-stop playtime on a single charge. Pros: No more long wires in your way now. Connect to devices using Bluetooth, NFC, and voice prompts. The iPad Pro is a perfect gaming console with its potential processor and storage of 256GB. The brilliant retina display of the iPad gives you an unparalleled gaming experience. It comes with all the triggers, buttons, and joysticks that you need to either defend your competitor or record a high score. This gaming console supports over 850 games and is still continuing to grow more. Being sleek in design, it perfectly fits your iPad. Pros: The Gamevice Controllers are compatible with iPad Air, iPad Air 2, iPad Pro 9.7 inch and other iPads. Free yourself from a backache or neck strains with one of these iPad Pro 10.5 inch accessories from Octa Spider Monkey. Mount your iPad on this tablet mount and enjoy hands-free viewing while sitting comfortably on sofa, bed, or couch. This silicone stand offers you to adjust the height, angle, and position of your iPad. It is capable of holding any iPads of size ranging from 5.9 inches to 8.75 inches. Pros: The modular design of this tablet mount enables you to unfold it into pieces and carry it along with you wherever you go. Grab these best iPad Pro 10.5 inch Accessories and customize your iPad Pro as per your style. Do share your choices and views in the comments section.